Pay your loan using an RCU Debit Card OR a debit card from another bank or credit union! What types of debit cards are accepted? What types of loans can I pay using a debit card? Is there a fee to make a loan payment with a debit card? If using an RCU Visa Debit card there is no fee to process this payment. If using a debit card from another bank or financial institution there is a $5 processing fee. 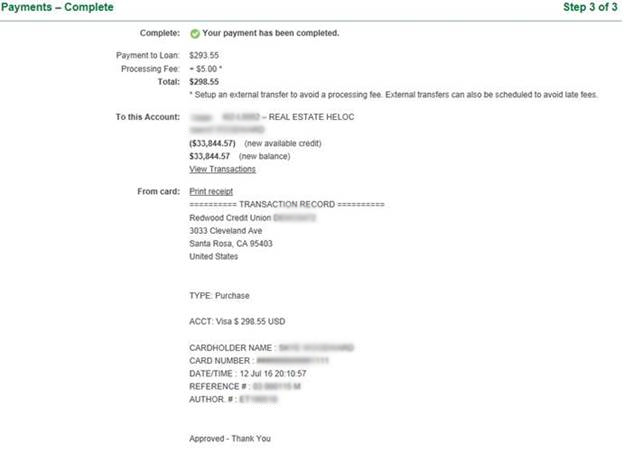 RCU is charged a fee to perform the transaction. We charge a minimal fee that does not recoup the entire cost of the transaction. The maximum is 2 times the minimum payment (plus the $5.00 fee if not using an RCU debit card). How do I make a loan payment with a debit card? Q. If I use my RCU debit card to pay their loan do they get Reward points? A. No, the transaction is not processed by the network. It is internal and fee free. Q. Are the payments processed right away? A. Payments are immediate. Visa payments are also immediate however the Visa balance is updated the next day. Q. Can I schedule a card payment? A. No, payments are immediate. If you want to schedule a payment you may use the External transfer loan payment option. Q. Can I set-up a recurring debit card loan payment? A. No, the payments are one time. If you would like to set-up recurring payments use External transfer loan payments. Q. 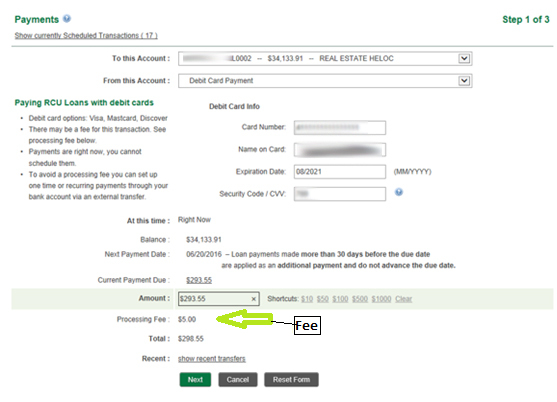 Why does RCU charge a $5.00 processing fee? A. A fee is only charged if the debit card being used is not an RCU debit card. RCU is charged a fee to perform the transaction. We charge a minimal fee that does not recover the entire cost to the credit union. Q. How can I avoid the fee? A. Make a payment using an RCU Debit card or use our External transfer loan payment service. The payments are easy to set up and process quickly. You can start, stop or change them at any time! Q. What if I miss-enter information? A. An error message will identify the incorrect information and request that it be reentered. For example, if you entered an incorrect expiration date, it will request that you renter the expiration date. Other examples include an invalid security code; invalid card number or incorrect name. Q. What happens if the payment does not go through? We are unable to process your request at this time. Please try again later. We apologize for any inconvenience.